Presentation: Amie Siegel, Black Moon at The New School | P! As a prelude to the book Speculation, Now—and to accompany the exhibition Post- Speculation at P!—Vera List Center for Art and Politics director Carin Kuoni and curator Elizabeth Thomas engage with artist Amie Siegel in a conversation about Black Moon (2010), Siegel’s three-part work that departs from Louis Malle’s 1975 film of the same title. In Siegel’s hands, Black Moon, which Malle described as a “…strange voyage to the limits of the medium,” becomes a present-day science fiction without dialogue, traversing multiple film tropes – action, guns, lonely campfires, the end of the world – and, like its band of armed female revolutionaries, resists taking up residence in a fixed narrative or genre. Set in the post-apocalyptic landscape of foreclosed housing developments in Florida and California, the houses and empty streets become protagonists of a silent narrative, a documentary of the recent past. The 2-channel video installation Black Moon/Mirrored Malle places an original 1975 interview with Louis Malle about his film “Black Moon” against a shot-for-shot version in which the artist herself plays Malle, enacting a gendered battle of authorship and doubled future within the present. 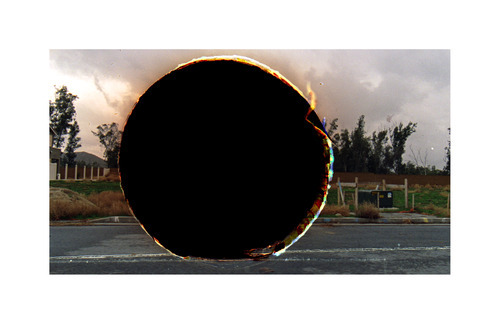 The film screening and discussion at the Vera List Center complement Black Moon/Hole Punches, a series of photographs that constitutes the third element of the Black Moon works, several of which are currently featured in the exhibition Post-Speculation at P! (through November 1). Together, they constitute an extended reflection on mediated narratives of dystopia and violence, isolation and utopia, appropriately dispersed across the city. Ranging from photographs, video, film installations, and feature films for the cinema, American artist Amie Siegel’s work has been exhibited in solo exhibitions including Amie Siegel: Provenance, currently on view at the Metropolitan Museum of Art, New York, as well as in recent solo and group exhibitions including Utopia for Sale?, MAXXI, Rome; City of Disappearances, CCA Wattis, San Francisco and the Zabludowicz Collection, London;Approximately Infinite Universe, Museum of Contemporary Art, San Diego; 5th Auckland Triennial, New Zealand;Amie Siegel, Part 1: Black Moon, Kunstmuseum Stuttgart; The Talent Show, MoMA/PS1, New York; Walker ArtCenter, Minneapolis; The Russian Linesman, Hayward Gallery, London; 2008 Whitney Biennial, Whitney Museum of American Art, New York, and Forum Expanded, KW Institute for Contemporary Art, Berlin. Her films have been shown at the Cannes Film Festival, Berlin International Film Festival, Toronto Film Festival, New York Film Festival, Museum of Modern Art, New York, and the National Gallery of Art, Washington, D.C. She has been a fellow of the DAAD Berliner-Künstlerprogramm, Guggenheim Foundation, a recipient of the ICA Boston’s 2010 Foster Prize, a 2012 Sundance Institute Film Fund award, the inaugural Forum Expanded Award at the 2014 Berlin Film Festival, and is a contributor to the book Speculation, Now (forthcoming from Duke University Press, in association with the Vera List Center for Art and Politics). Elizabeth Thomas is a curator and writer, currently working independently and as Senior Lecturer in Curatorial Practice at the California College of the Arts. She recently curated Katharina Grosse’s installation psychylustro along Philadelphia’s Northeast Rail Corridor and is developing public commissions with Michael Rakowitz and Andrea Bowers through a new collaborative public practice agency she is initiating. Previously, as MATRIX Curator at the UC Berkeley Art Museum, she considered central questions of research, interdisciplinarity, experimentation, and political and social engagement through projects with Omer Fast, Futurefarmers, Mario Garcia Torres, Jill Magid, Ahmet Ogut, Trevor Paglen, Emily Roysdon, Tomas Saraceno, Allison Smith, and Tris Vonna-Michell, among others. She was recently in residence at SALT, Istanbul, through which she is producing a book of interviews on the relationship of ignorance to knowledge production. Her independent projectshave appeared (or will appear) at University of Michigan Museum of Art, San Francisco Museum of Modern Art, Mass MoCA, Mills College, Temple Gallery, and the Andy Warhol Museum. Current and recent publications include Futurefarmers’ monograph A Variation on Powers of Ten with Bildmuseet, Sweden and Marc Fischer’s Public Collectors with Inventory Press. She held previous curatorial positions at the Carnegie Museum of Art and the Walker Art Center. Thomas is also a contributor to the book Speculation, Now (forthcoming from Duke University Press, in association with the Vera List Center). This talk is presented by the Vera List Center on the occasion of the exhibition Post-Speculation, in advance of the publication of the book Speculation, Now.